We've been supporting real estate agents in the Phoenix area for years with web design, security maintenance, and marketing-related services. As a husband and wife team, we offer experienced, fast, affordable, and personalized attention to your web design project. Your website needs to look great, be easy to read, and easy to navigate. Unfortunately, slow-loading websites don't rank well in Google and people are impatient. They will move on to another site within 6 seconds. Easy and obvious ways to contact you. Call-to-actions such as your click-to-call phone number, a professional contact page, and signup or scheduling forms are vital to your website's success. Get More Clients. Make More Money. Use a CRM autoresponder for fast follow-up and to build your email list. We can integrate an e-newsletter signup form on your website and connect the contact form to your autoresponder software for an automated response to new leads. If you don't currently use an autoresponder, check into the free and easy-to-use MailChimp. Provide mortgage calculators, up-to-date market information, articles on the home buying and selling process, budgeting and credit tips. Details about neighborhoods, schools, attractions, utilities, statistics, history and more that sets you apart, builds your credibility and boosts your SEO while providing an appreciated service to your customers. We have a supply of stock photos that can be used on your real estate website. But these images are generic. They could be used on any website, sometimes they 'look' generic, and they do nothing to help you stand out among your competitors. Keep a camera with you at all times and snap custom community photos for the various pages on your site. Link to mortgage, insurance, contractor, and other local experts you trust - and have them link back to your website as well. This is great for SEO and a natural referral program. Online client testimonials and reviews are almost as effective as personal referrals. Proactively collect online reviews at various websites (i.e. your Google business listing, Yelp, Zillow, etc.). Also, we suggest you request reviews right on your website and publish them all on a Testimonials page. If writing isn't your thing, it may be worthwhile to hire out copywriting. We can help you get started. The fact is, content is king on the internet and web users aggressively seek information more than anything else online. We strongly suggest that you post one or two high-quality, high-value 1,000+ word articles with accompanying photos on your blog every month. Like you, much of our business comes from referrals. We love turning our customers into friends. We always look out for our customers' best interests. We want to get to know you and your specific needs so we can help you reach your goals. We will create a unique website, all your own, not a cookie-cutter template site. We will fill it with lead generation features to help you grow as well as benefits your clients will love. Yours for a reasonable price in a modest timeframe. Even though your agency may provide you with a website of your own, it is suggested to have your own, personal website as well. You may decide the agency you are with is not the best fit for you anymore and decide to leave. Then what? You may lose some of your contacts, and the website you had is no longer yours. Branding yourself will help you in the long run. 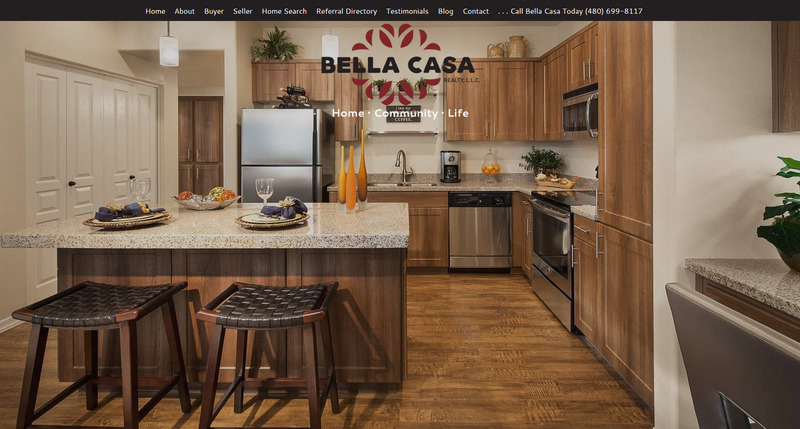 Get started on your real estate website design project today by calling Evelyn at 480-656-6059 or sending us a contact form message.